Tiny Love is a fairly well known brand, and one in which I've purchased from with both children. There large play mat is one of my favourite ever purchases. So recently when asked if we would like to review for them I knew it would be a well loved toy. Upon looking at the website I wasn't sure if they would be of much use to Isla now as most are aimed at babies. However we received this Musical Stack & Ball Game, and its been one of Islas favourite toys to play with. 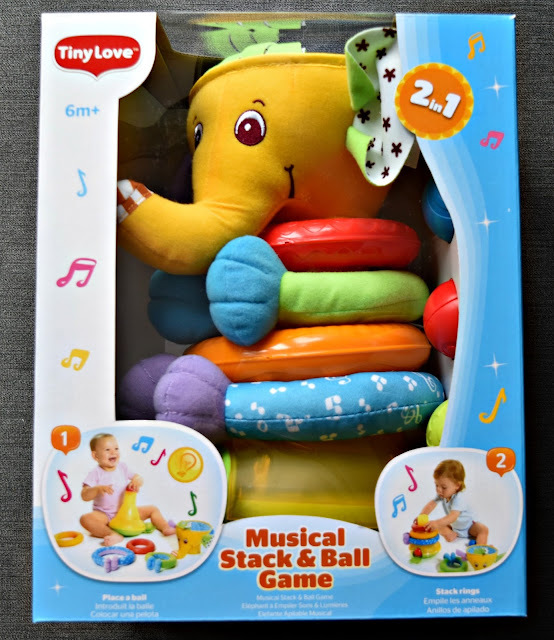 The game combines two classic baby games - stacking and ball play and has many different play options depending on the age of your child. A younger child will possibly be more interested in the balls provided shaking them around and developing their sense of sound. Then when they get older, placing the ball into the space provided and waiting for it to return at the lower end. Even placing the ball within the hole can be advanced further. Initially you can use the elephants head as a funnel which fits over and directs the ball, when they get older they can further develop their skills by removing the elephant head showing just the smaller space and placing it within there. As the ball goes down it lights up and plays a sound teaching you child about cause and effect too. As well as this, there is also the stacking aspect of the toy. You can remove the elephant head, then the rings from below. You get two solid rings and two which are soft which act as hands and feet and have velcro meaning you can fasten together too. Isla has enjoyed all aspects of this toy and I'm so glad we took the chance as even at just over 12 months she is having so much enjoyment from this. I feel this is a great development toy as you can learn so many new skills to develop your child further from just this single toy. Please Note: I received this toy in exchange for an honest and open review, all views and opinions are my own and not influenced in any way.